Hyporion: Why Was Keynes Different? "If among a nation of hunters, for example, it usually costs twice the labour to kill an eager which it does to kill a deer, one beaver should naturally exchange for or be worth two deer." The state of nature argument was well established in 18th century thought, not least by Smith's mentor Hume. The point of a state of nature argument is not historical account (it his said that in the throes of the unguarded ecstasy of madness Rousseau actually believed in the historicity of such thoughts - I doubt this is so), but rather to show, in Voltaire's famous phrase, if something did not exist it would be necessary to invent it. Hume's famous rowers showed that social equilibrium would be invented even without language, demonstrating that conventions come first (logically speaking) and linguistic agreement after. Smith's hunters show that a market and a (relative) price system "come first" and formal markets after. It also demonstrates why ratios of prices are fundamental, rather than differences (try the argument with differences and see what happens). When labor is the only input the hunter can use (which is, for the economist, "production"), one has an easy and agreeable labour theory of value - though, of course, once there are multiple inputs this story loses its agreeability. But this is unnecessary, Keynes is a marginalist like any other. Subjective value is part of his analysis, just like it was your high school Econ teacher. We have to keep going past Adam Smith now. Here comes Irving Fisher, perhaps the greatest economist of all time ... though not gifted with deep personal wisdom. His American accent will be more familiar than Smith's 18th century Scottish brogue. He asks us to consider not hunting today, but hunting tomorrow as well. Let's say that a deer in the hand is worth two in the bush. How many deer today is a beaver tomorrow worth? The answer must be four - a beaver is worth two deer and a tomorrow is worth half a today. But what if the difficulty of hunting changes with the seasons? Let's say that hunting is easier next season, so that the same amount of labor that gets one beaver today will also get two deer tomorow, three beaver tomorrow or four deer tomorrow. Then a promise of a deer tomorrow is worth half a deer today, the promise of a beaver tomorrow is worth a third of a deer today and the promise of a beaver tomorrow is worth 3/2 of a deer today. In terms of marginal analysis, this is the product rule for derivatives applied to a simple spot & future market. If the market left this so-called "intertemporal equilibrium", then anyone could gain just by cyclically trading beaver & deer. This arbitrage argument is in Keynes's General Theory (Chapter 17, part II). So far, so good. Right now we're telling the story that Brad DeLong calls The Story Of The 20th Century - that of production increases & galloping scientific innovation. Economics is a serious subject about the things of our lives - the clean water, the iPhones and the clothes all together. 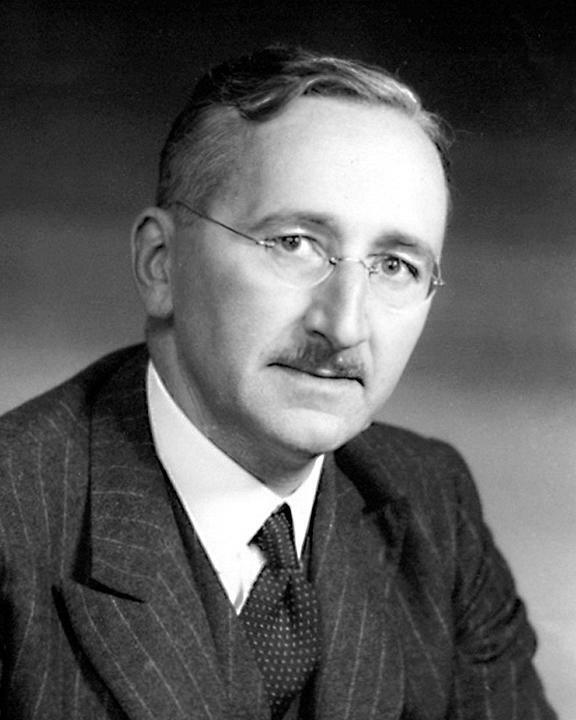 Knight, Hayek and Schumpeter see that the entrepreneur is the central actor, able to take on uninsurable risks because they have local knowledge that others can't get - and the romantic temperament that drives the will to power. And this is - as far as it goes - undeniably true. But it doesn't go all the way. 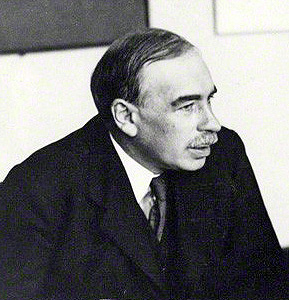 The ancients called wise he who can control his enemies - and Keynes was a wise guy as well as a great man. The name The General Theory Of Employment, Interest And Money was a trick but not an underhanded one. It is that, but this isn't mainly that. The book is really an exposition of a Money Theory Of Production. Keynes announced such a book before writing it and admits it in the aforementioned Chapter 17. Knight and Viner - the Old Men of Chicago - obsessed over the poorly named concept of the "long run". What this really means is that the path of production is picked out more or less like the beavers and the deer above, except lucky years are replaced by lucky (or, rarely, talented) entrepreneurs. In modern terms, this is called "golden path growth" and the obsession is justified by "turnpike theorems". But Keynes, the greatest of the international monetary theorists and practitioners, saw that in many countries unbalanced flow & pricing of gold destroyed industries even though they were stocked to the gills with gutsy entrepreneurs and genius scientists. Why, back with our hunters, do you think that just because they can get the deer and beaver at the rates quoted they necessarily will? Must every hunter go out for the hunt? This is a very crude way of thinking about "output in general". Surely a hunter could become irrationally exuberant (filled with romance, let's say) about his ability to kill beaver and hunt it in defiance of logic - and surely this would alter the price ratio whether he gets lucky or not. 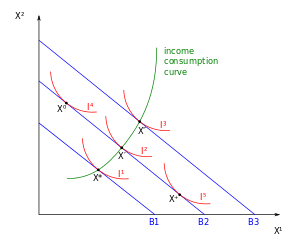 Surely each level of output, in terms of labor spent, is associated with a particular price system - in economic terms, each quantity of labour to spend gives a different production possibility frontier which, as it's dragged out doesn't necessarily touch the indifference curve at a locus of points drawing a straight line. That's 2deep4me. Let's hear one last folk tale instead. Next year doesn't make it easier to hunt in general. Instead, next year the amount of labor to catch a beaver will be four times what it takes to hunt a deer tomorrow - and that amount will stay static. Now nobody would buy a promise for a deer tomorrow at a market clearing price. The asset whose rate of production has climbed most rapidly with output in general has knocked out the other assets - exactly as Keynes taught in Chapter 17! You might be thinking "Where's the unemployment, the interest rates & the money?". They're all there. The fast one I pulled is to talk about the path of production instead of the "interest rate". Interest rates are an abstraction, what exists are things and prices. Only after acclimatization in the polite fiction of interest rates does the intertemporal & Keynesian world make obvious sense. If I had said "The money-rate of interest rules the roost." one would be off talking about unrelated things. But when I say the identical, but differently worded "The production path of money knocks out less profitable production paths." it suddenly feels alien, requiring proof and argument. Which is what Keynes did. Keynes ruined economists lives in order to save civilians. Before Keynes, all economists agreed that just because the story of the 20th century was about innovation and not money it should be the story that economists tell. Schumpeter the romantic was so furious that he said that if Keynes would not tell this story he wasn't an economist at all! It seemed so obvious that economists must focus on The Story, right? Keynes made economists not the epic poets of innovation but mere dentists checking Ulysses teeth before he goes to war.